Corrosion resistant, lightweight and durable..
Deck features 1-1/2" lip turned down for a smooth surface, or lips up for a contained area. Strong, sturdy and lightweight aluminum construction -- supports loads up to 1200 lbs. Deck is bolted together with galvanized fasteners. 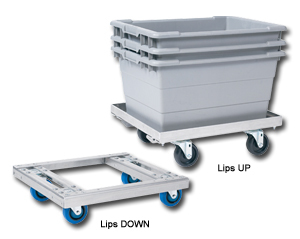 Includes bolt-on swivel casters in choice of 4" x 1-1/4" Resilex or 4" x 1-1/4" Polyolefin casters. Ships completely assembled and ready to use. FOB Shipping Point. Product No. Deck Size Deck Height Wt. (lbs.) Price Ea.